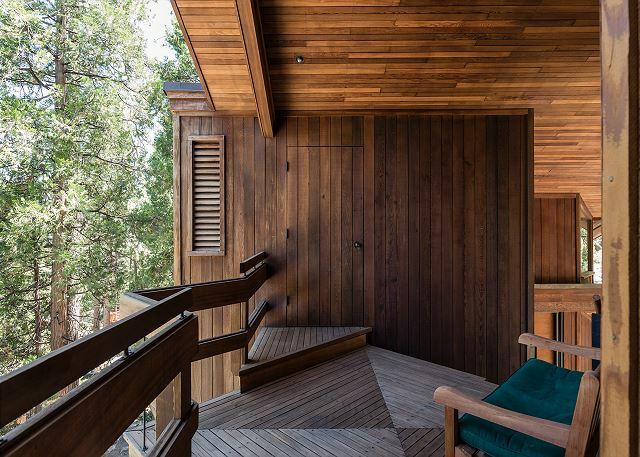 Architect's Dream is built into the lot's natural surroundings. 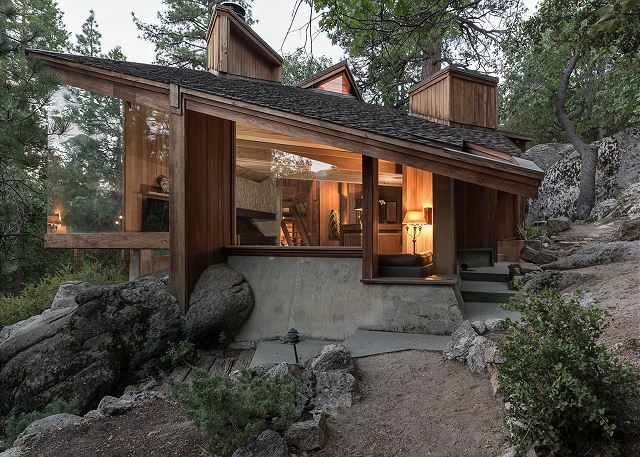 Come stay at the beautiful Architect's Dream! Gaze at the beautiful winter landscape while staying warm indoors. Architect's Dream during the winter. 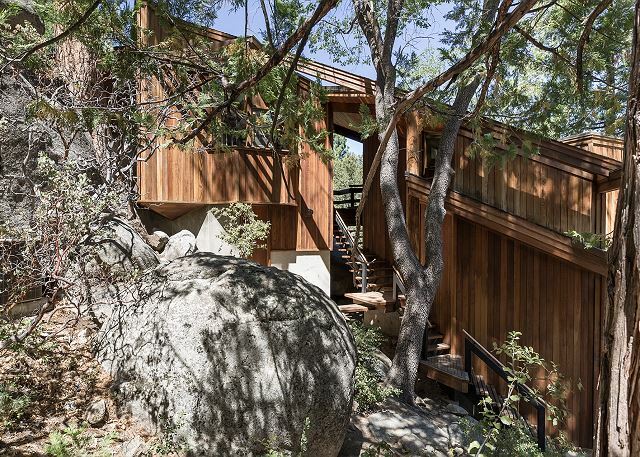 The design of the home reflects the original owner & architect's desire to keep the towering tree on the left & boulders intact. 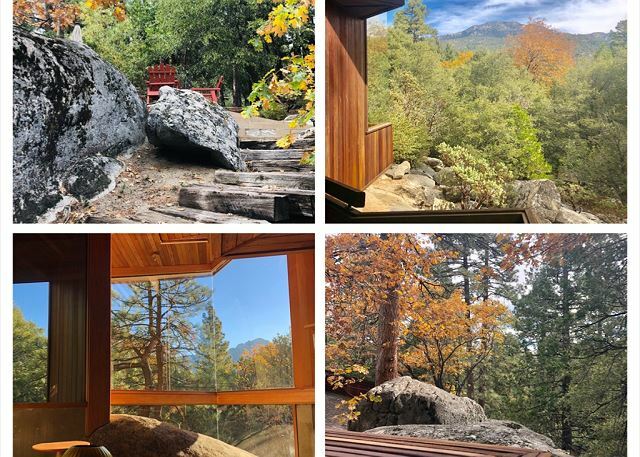 Living room has view & giant boulder in house. 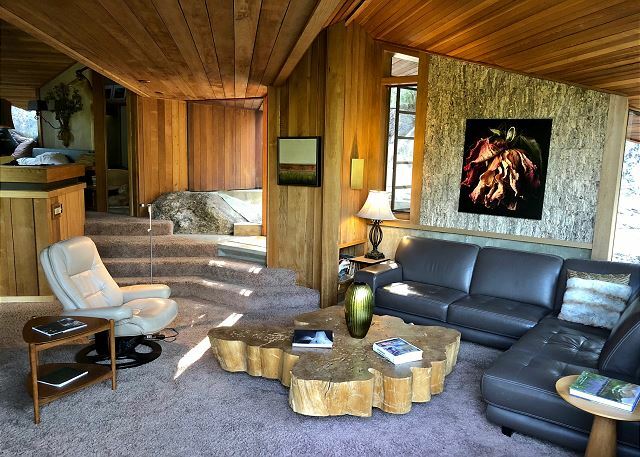 Open living room with large piece of cedar tree serving as a coffee table. 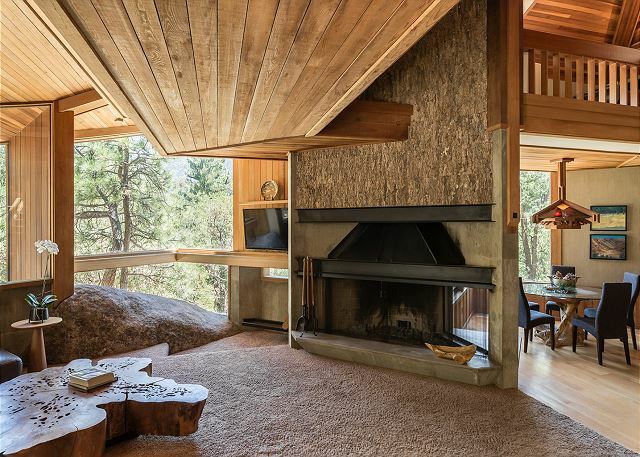 Contributing to the living room's character is a boulder that is part of the home & expansive wood burning fireplace. 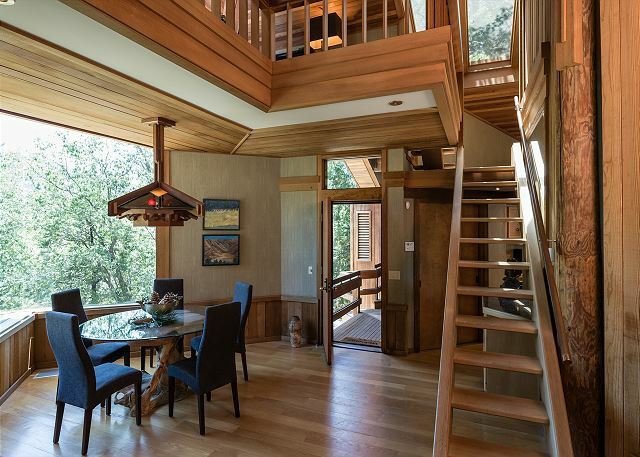 Dining Area with stairs to loft bedroom. 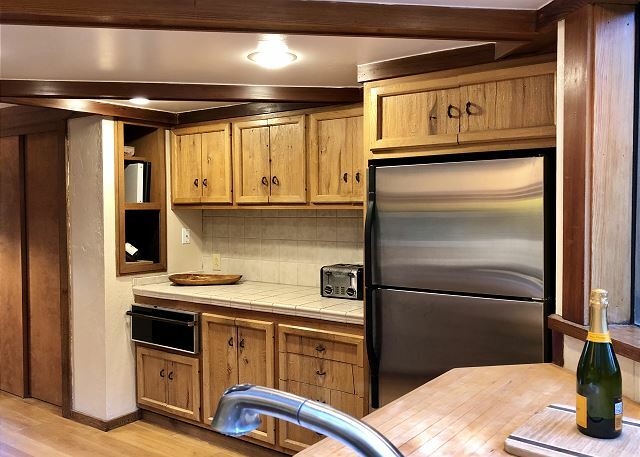 Fully equipped kitchen with custom cabinets. 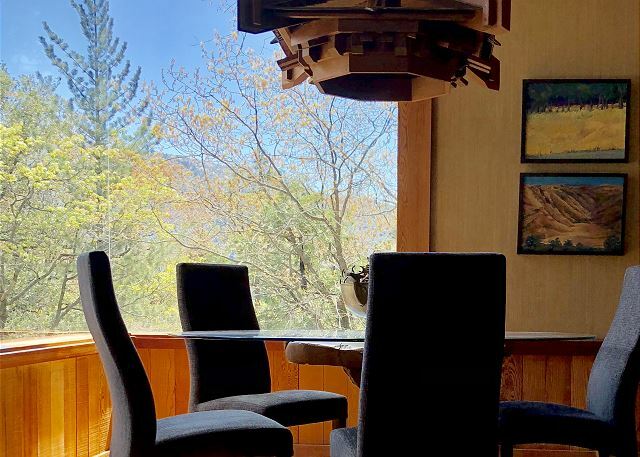 Bright sunny kitchen with view of forest. Master bedroom opens up to living room. 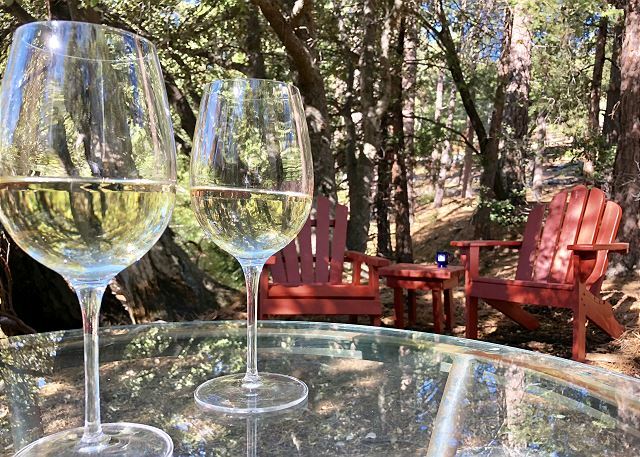 After a day enjoying the town come, relax & unwind with glass of wine. 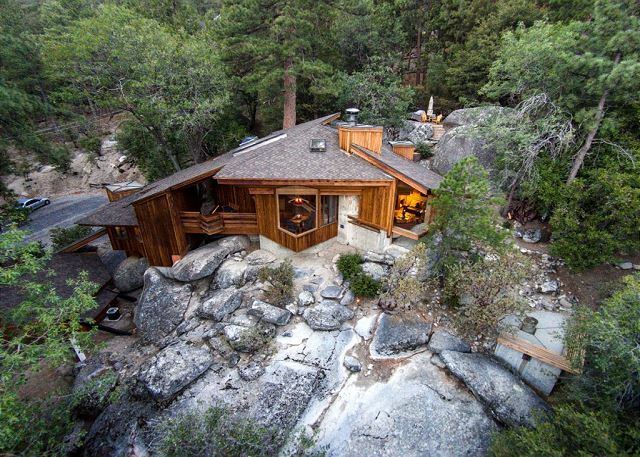 One of a kind home that will take your breathe away. Sorry jaguar not included unless you ask us nicely. 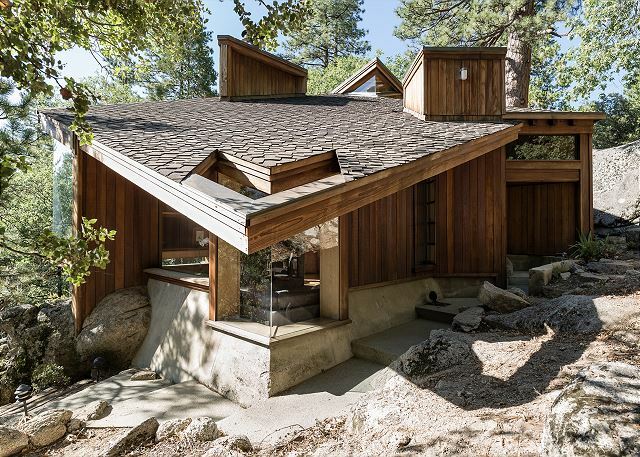 Built with boulders as part of the foundation Architect's Dream is nestled in a wooded Idyllwild neighborhood. 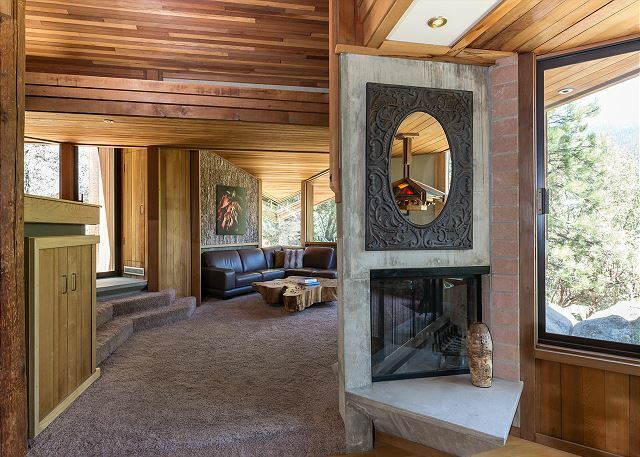 Expansive window gives you the feeling of standing on a hillside. Bird's eye view of the home. 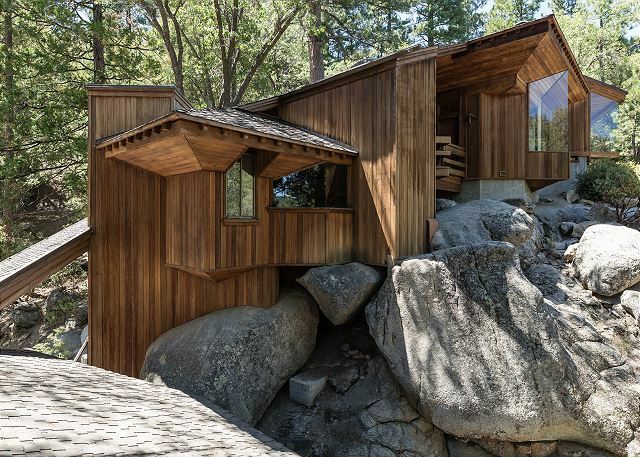 Perched among boulders with incredible mountain views, is a unique architectural home constructed with old growth redwood, concrete and soaring corner glass windows. 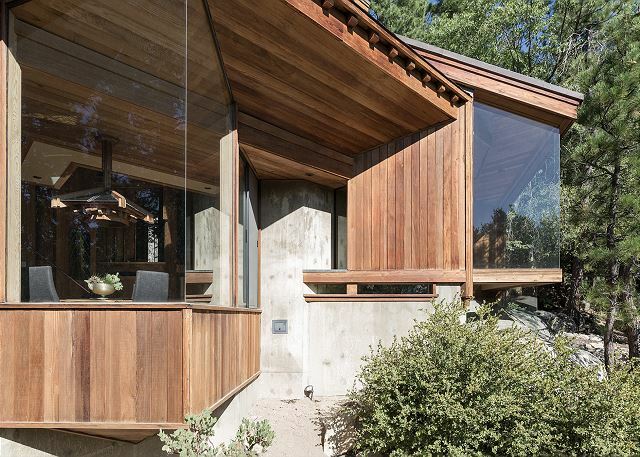 The home was designed and built by locally renowned architect Dennis McGuire. 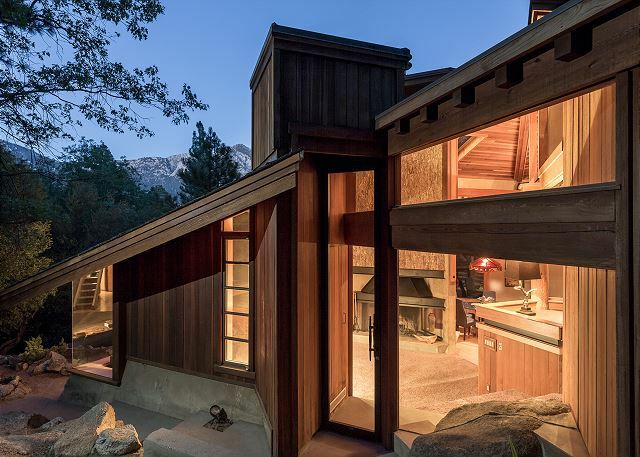 It has been photographed numerous times, including by Julius Shulman, famous photographer of mid century architecture. 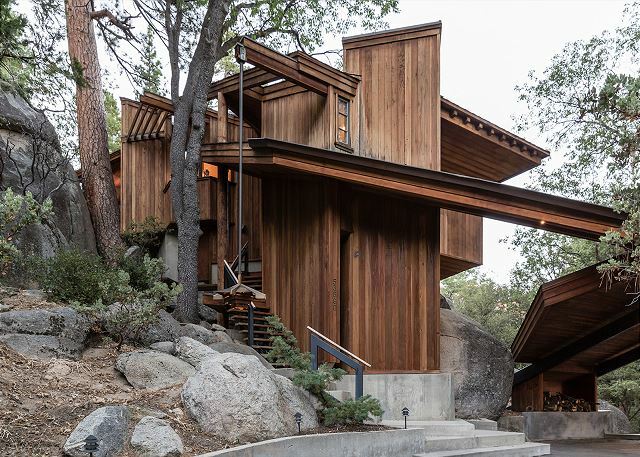 The house is a marvel of engineering with a very open design and soaring 25 ft wood ceilings. 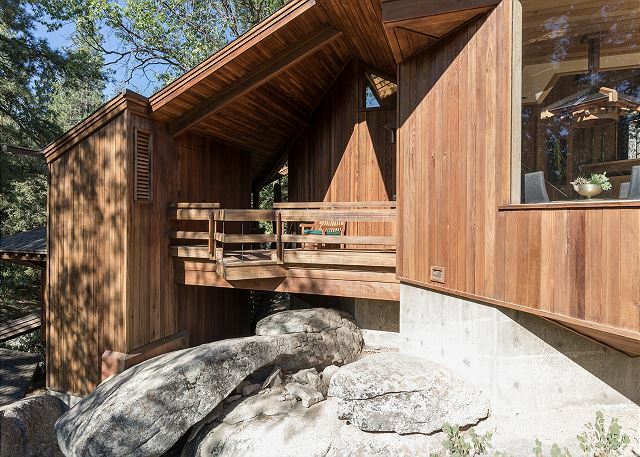 The architect's extensive use of glass as well as incorporating existing boulders into the house gives a seamless indoor/outdoor experience. 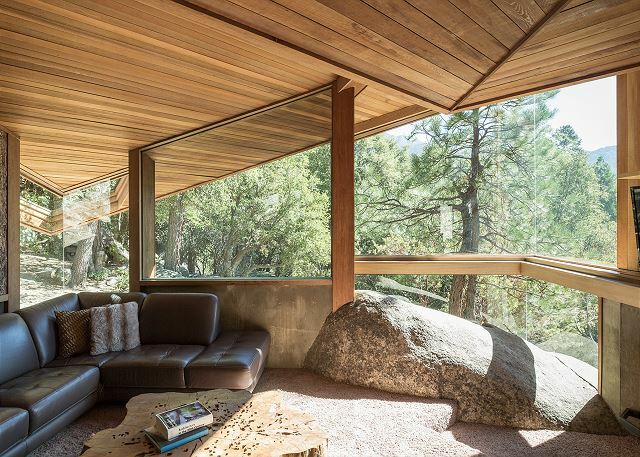 Contributing to the living room’s character is large slice of a cedar tree serving as a coffee table, and cork bark tiles on the far wall. The master bedroom includes a king sized bed, large desk space (perfect for those who like to catch up on some emails) and a in suite bathroom. 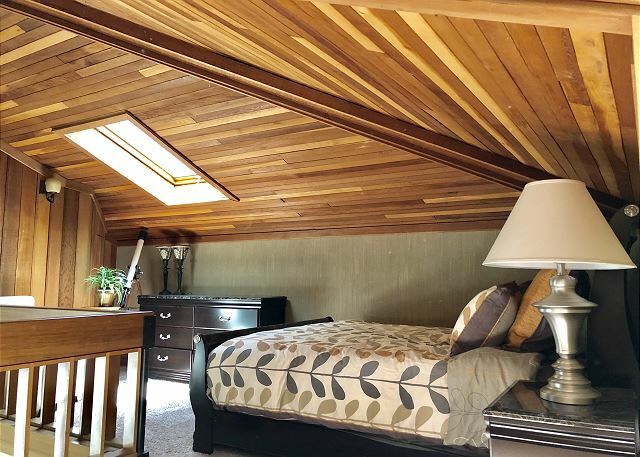 Upstairs loft bedroom has a queen sized bed and it's own in suite bathroom as well. 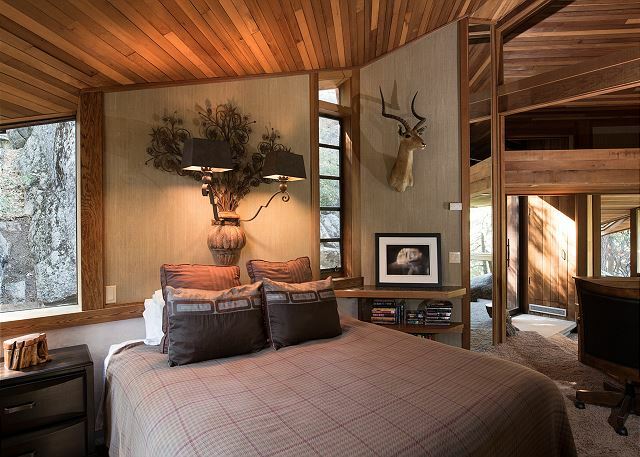 Finally, the third bedroom is the casita bedroom which has its own private entrance and bathroom.The outdoor spaces compliment the interior. 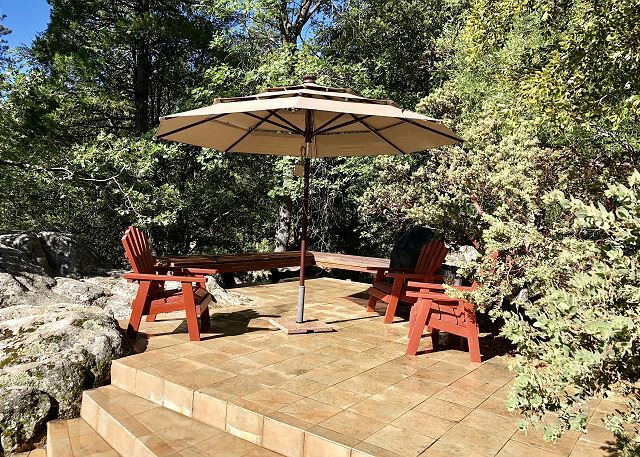 There are 2 patios, the largest has commanding views, built in benches, Adirondack chairs, market umbrella and gas grill. There is a hammock nestled among the trees. Paths and steps wind among giant boulders and soaring pines. 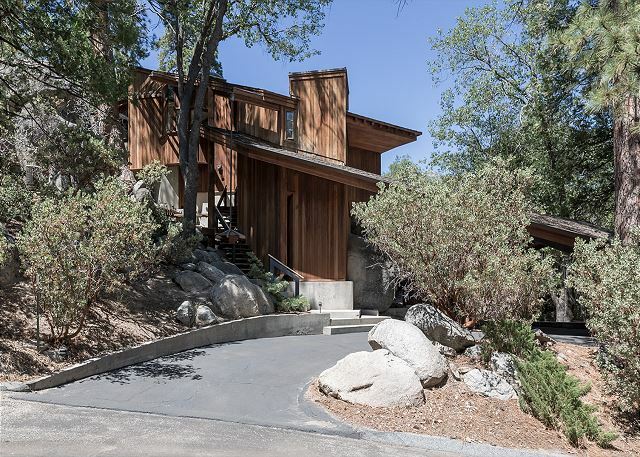 The house is in a quiet neighborhood that is adjacent to the Nature Center with many hiking trails in the state park / wilderness. 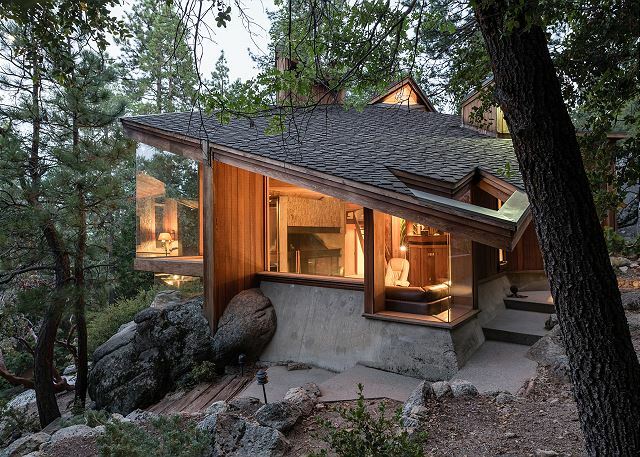 This home is truly a jewel in the forest. 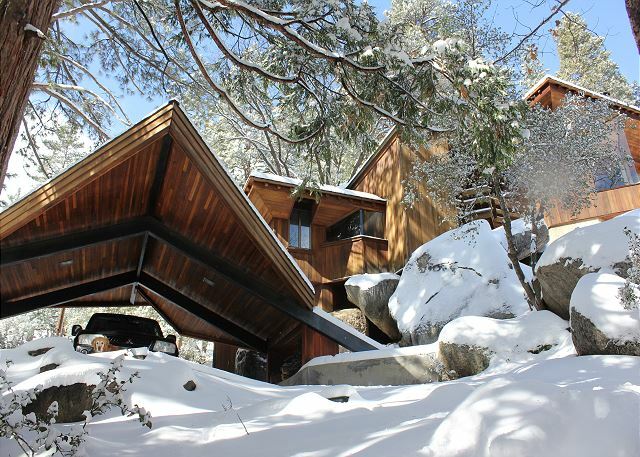 Architect’s Dream is perfect for two couples & small groups who want to experience Idyllwild. We enjoyed our time here. 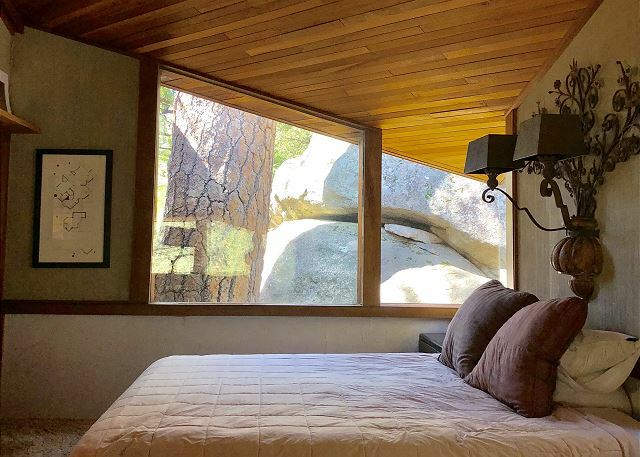 The home is beautiful and Idyllwild is a fun little mountain town.